When our chef André visited Marrakech, he adored the bustling night markets and the way they come alive when the sun sets. They’re just packed with the freshest most seductively well-spiced food for miles around. 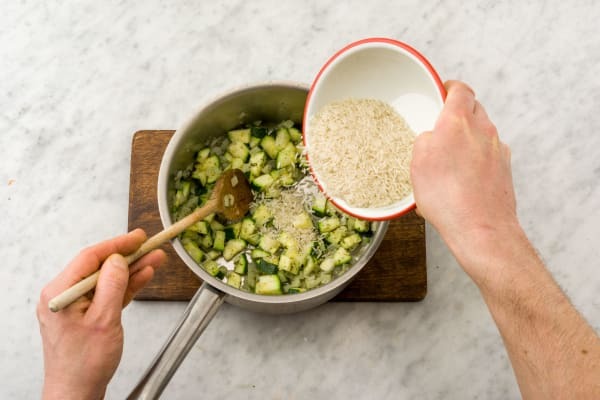 That perfect memory of deep, rich, chargrilled chicken is the inspiration for his chermoula and yogurt spiced chicken, with his zesty courgette pilaf. Your first job is to marinate the chicken. The longer the better is the rule with marinating! 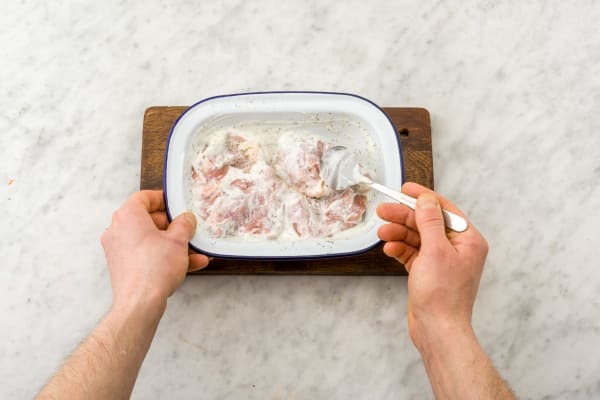 In a bowl, mix the chicken with the chermoula spice mix, half the yoghurt, 1/4 tsp of salt and a good grind of pepper. Make sure the chicken is well coated and put back in the fridge. Peel and cut the onion in half through the root and chop half into small chunks (½cm is ideal!). 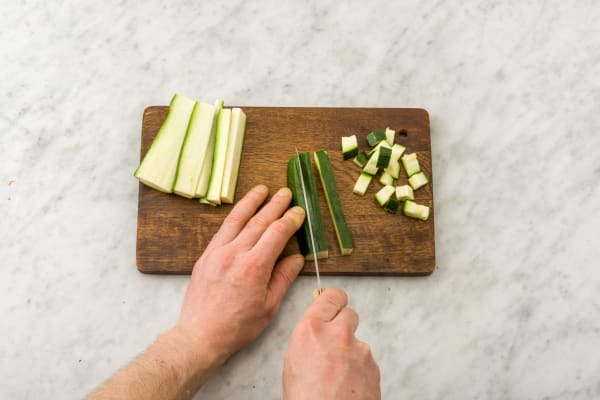 Chop the top and bottom off the courgette and cut in half lengthways. Cut each half into three long strips and then chop at 1cm intervals to create small chunks. Peel the garlic and chop finely (use a garlic press if you have one!). Tear off the leaves from the coriander and chop the stalks as small as you can. Keep the leaves for later. Heat a saucepan over medium heat and add 1 tbsp of oil. Cook the onion for 5 mins or until softened. Add the chopped garlic,coriander stalks and the courgette. Season with ¼ tsp of salt and a good grind of black pepper. Stir in the basmati rice and make sure the rice is coated with all the flavours in the pan. Pour in 350ml of cold water with the chicken stock pot and bring to the boil. Once boiling, reduce the heat to a simmer, put a lid on the pan and cook for 10 mins. Finish the rice dish by removing the pan from the heat (lid still on!) and leave to continue cooking in its own steam, for a further 10 mins. As the rice cooks, pre-heat your grill to its highest setting. Put the chicken on a baking tray and cook it for 15 mins. 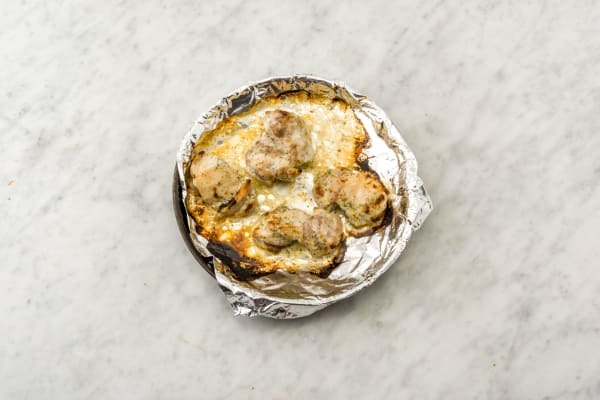 Tip:You want the yogurt marinade to scorch, so don’t be tempted to turn the grill down. It’s all about flavour! Turn the chicken after 7 mins and cook for another 7 mins or until the centre is no longer pink. Chop the coriander leaves and zest and juice half the lemon whilst the rice and chicken do their thing. Mix the lemon zest through the remaining yoghurt and keep to one side. Once the rice is ready, stir in the coriander leaves and half the lemon juice. Taste and add more salt if needed and more lemon if you feel it needs a bit more zing! 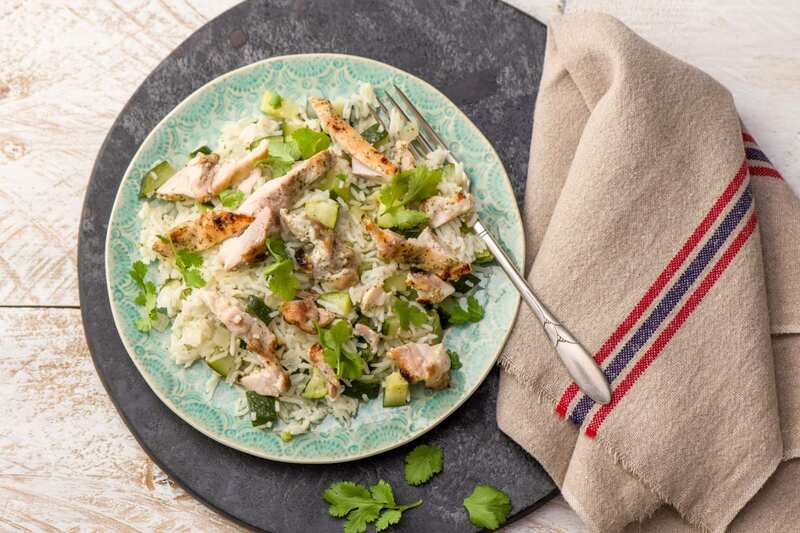 Cut the chicken into ½cm strips and serve on top of a bed of rice. Finish with dollops of the lemony yoghurt and enjoy!